Hey this is just the sort of thing I was looking for, and it looks like it only went up a couple weeks ago. I am wanting to use dzen to show recent headlines from a website’s feed. This is no problem, but I want it to update every 10 minutes, say. I of course was scheduling a cron job when I realized I don’t think that will work, since I want the output “updated” within the currently running dzen process, not a new one to take over. I suppose my cronjob could kill the running dzen process and then start a new one with new input, but I am going to try your method first, simply changing the sleep to a much higher number. Thanks! >>..But I am going to try your method first, simply changing the sleep to a much higher number. Thanks! No problem at all. I’ve updated the scripts I’m currently using a bit further to reduce the number of messages being printed in the console, and to be able to run the script from anywhere, not just from within the scripts working directory. If you need a hand with those items, let me know and I’ll post the updates here. 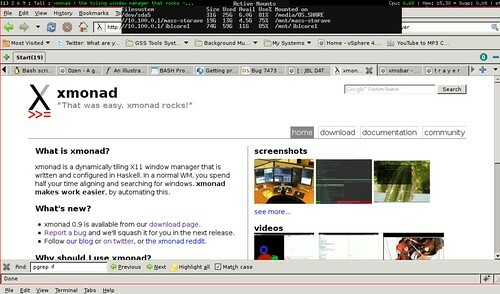 xmonad is fairly minimalist window manager. It’s very powerful if your the kind of person that hates reaching for the mouse every time. But because of this minimalism, it also lacks some very convenient things like a system tray for gnome applets (like Tomboy or Pidgin), or status/notification bar for the time and date, or to see workspaces (virtual desktops) have applications on them. 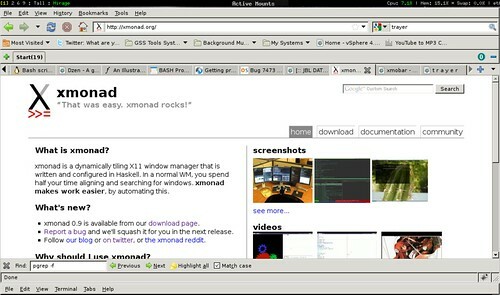 The programs “trayer” and “xmobar” are used to give xmonad these missing features. DZEN is just another one of those applications that just seems to “fit” with xmonad, because you can use it any way you want. You can have it in your face with lots of menus and options, or keep it out of the way; for example, make it part of “xmobar” the way I did in the screen shots. I’m glad you found this useful – and good luck with your headlines applet! Would you mind mailing the bash script to me (I think you can see my email since I filled it in for these posts). I’m not using perl for my info gathering portion, so don’t need that. Regarding xmonad, your explanation sounds like how I am using dzen with openbox, which seems very minimalist to me, also. I’ll have to check out xmonad sometime. or just post the update here, that will work too, of course. I’ll eventually update this post with the changes. Really the only things that were modified were the references to the perl script, were they were relative before, they’re now absolute.